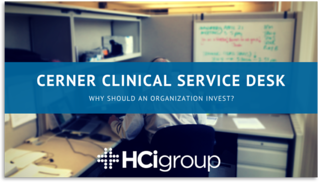 Cerner Clinical Service Desk: Why Should an Organization Invest? Cerner is a huge IT investment rivaling that of brick and mortar investments. Once you're live, you don't want to reduce your IT support to the least common denominator, often a helpdesk or service desk. If you're considering investing in a Cerner Clinical Service Desk, you need to leverage its capabilites to maximize the investment you've made in your new Cerner EHR system. On the service desk level, your team is supporting 300 other applications besides those in the Cerner suite. As such, it’s often unrealistic to expect your service resources to be experts in a diverse array of Cerner modules. So, what typically happens is that a majority of service desks operate in a catch and dispatch mode. They collect as much information as possible about the issue, and then relay the problem to a tier two analyst, who either remediates the issue, answers the question, or handles the intake process for an optimization request. This model is usually inefficient; the service desk will often require another dialogue between the tier two analysts and the person making the request to get a full, comprehensive understanding of the problem at hand. This can turn into two iterations, three iterations, etc., in an attempt to solve a single issue. It also detracts from your high-level, high-dollar labor resources at the upper tier level, who are also performing project implementations, upgrades, maintenance, and optimizations. So, enter into the equation a tier one-and-a-half model. This is what's known as an 'application service desk' or 'a clinical service desk.' It will be staffed with resources that are skilled in Cerner, who are able to immediately remediate issues as they come in, and more importantly, collect all the pertinent information for problems beyond their skillset and route them appropriately to tier two. The goal here is to cut down on iterations, so there's no unnecessary back and forth between the tier two person and the person making the request. The tier two staff get the information from the clinical service desk and it’s immediately actionable, thereby eliminating the possibility of a backlog. Additionally, this allows you to maximize Cerner’s AMS service, because now you have somebody that can manage the AMS on behalf of the IT department. If you are going to invest in a clinical service desk, this should be one of their assigned tasks. That way, you can alleviate the need for your tier two analysts to monitor their relationship with the tier three analysts and Cerner. Your primary objective is to be the client’s advocate. Make sure that the ticket coming in is driven to a conclusion as efficiently and accurately as possible. Keep up with the latest industry expertise by subscribing to our blog below.